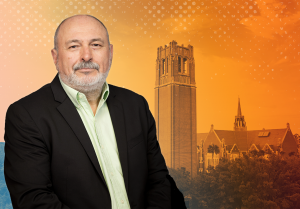 Dr. Panos M. Pardalos, a distinguished professor for the Department of Industrial & Systems Engineering (ISE) at the University of Florida has received the Humboldt Research Award. This award, granted by the Alexander Von Humboldt Foundation, is given to 100 researchers annually in recognition of their entire academic achievements with the expectation that they will continue to produce cutting edge achievements in the years to come. Pardalos, who is a world leading expert in global and combinatorial optimization, has had a significant academic career to date, and his extensive list of achievements continues to grow. In addition to being a distinguished professor for ISE at UF, Pardalos is the director of the Center for Applied Optimization, an interdisciplinary center that encourages research among faculty from engineering, mathematics, and business, and is also an affiliated faculty member of the Department of Computer & Information Science, the Hellenic Studies Center, and the Department of Biomedical Engineering. He has written and co-authored over 200 books and journals on the topics of optimization and big data, hosts conferences all over the world, and has received multiple awards, including a University Term Professorship from UF for the years of 2018-2021. By receiving the Humboldt Research Award, Pardalos will also have the opportunity to continue his collaboration efforts on a long-term research project at an institute in Germany for up to one year, a benefit offered to all award winners. “I would like to use this opportunity to learn about the European research community, the German scientific community and culture in particular, and their research environment, and to establish collaborations with prominent research groups,” said Pardalos. “For example, I plan to work with Professor Steffen Rebennack and his colleagues at the Karlsruhuer Institute of Technology on a number of problems of mutual interest including energy problems and robustness of networks,” said Pardalos. The award will be presented to Pardalos by the Alexander Von Humboldt Foundation in Bamberg, Germany later this month.